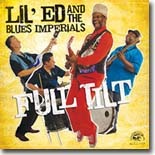 We all love the music of Chicago wild man Lil' Ed & the Blues Imperials, so any new CD by this band is an easy choice for our Pick Hit. Full Tilt is their latest house rockin' masterpiece. Few blues artists are as unique as Mississippi's Super Chikan. He's more than a novelty act, though, as you'll hear on this month's Surprise hit, Sum' Mo' Chikan. We look back at one of Larry Garner's early releases, the excellent You Need To Live A Little. It's this month's Flashback feature. Our What's New section features new releases from Buddy Guy, JW-Jones Band, Willie "Big Eyes" Smith, Albert Cummings, Paul Rishell and Annie Raines, Nelsen Adelard, Magic Slim, Delta Moon, and more.